There are many diseases spread by mosquitoes that are dangerous for both humans and animals. The best ways to protect yourself are to avoid being bit and to get rid of mosquito breeding site. Click on the images below to learn how to protect yourself at home, and away from home. Feel free to share these brochures on social media, like facebook, or print out and pass to your friends and family. Wet, damp conditions do increase the number of mosquitoes. The mosquitoes are better able to breed and reproduce in wet conditions. After heavy rains, we do expect to see increases in mosquito population. The most recent case of Zika found in Maui was in 2017. Mosquitos may be small however its a threat to Hawaii so always stay protected to avoid any diseases. This is an important note to make of WNV, which depends on an avian host for amplification. Dengue, Zika, and chik are are concern to us in Hawaii, and these three viruses have evolved and can use humans for their amplification. Several years ago, when all 48 Continental states had cases of WNV, Hawaii and Alaska did not, despite receiving travelers from infected states. The avian requirement would explain why human visitors were insufficient at spreading the virus to mosquitoes here in Hawaii. I live on Maui and I was wondering what was the most recent case of Zika found on Maui? We have had 5 cases of Zika on Maui over the past several years. The most recent case of Zika was in 2017. There are not currently any cases of mosquito-borne diseases in Maui. When a mosquito bites an infected person the mosquito doesn’t get sick or die. The most important way to prevent mosquitoes from spreading diseases is to prevent mosquitoes from breeding (get rid of standing water) and also to prevent mosquito bites. Also, it’s important to remember that Zika can be spread sexually from an infected individual to their partner. I found that the prevention tips in this article were really informative and helpful. Thank you! Is there many different types of ways to prevent mosquitoes from spreading there diseases to people that many people are not aware of. How often do mosquitoes die because they bit an infected person? Are there currently any cases of mosquito-borne diseases on Maui? What was the most recent case of Zika found on Maui? This website had a lot of good information and informed me on how to control and protect myself from mosquito diseases. Great infographics, it helps me understand and visualize it more, such as the ways to protect yourself. My question is, how many cases of Zika virus have happened in Maui? This was very informational and helpful to spread awareness about mosquito-borne illnesses. This website has good information on how to prevent you from getting mosquito born illnesses. There are also really good info graphs in this website. The Information that i read are very helpful and informational. As of right now, we have no cases of Zika on Maui. We are returning to Maui for two weeks in September and wanted to know if there are any zitka hotspots we need to be aware of and avoid. The shower area at Haycraft Park in Maalaea was inspected on August 26, 2016. Water from the shower is ponding in the grassy area and mosquito larvae were present. If this park is under the jurisdiction of County of Maui Parks Department, please advise them to take corrective measures to eliminate the mosquito breeding and standing water. Thanks for the notice. Field observations are a great help to finding and eliminating mosquito breeding sites. I’ll inform the County as well as put in a request to the supervisor in charge of Vector Control to conduct an inspection. There is standing water in Haycraft Park in Maalaea resulting form an outside shower with no drainage. Someone at the county should fix this problem. Either construct a drain or turn off the shower. Whoa, Thank you for the insight! 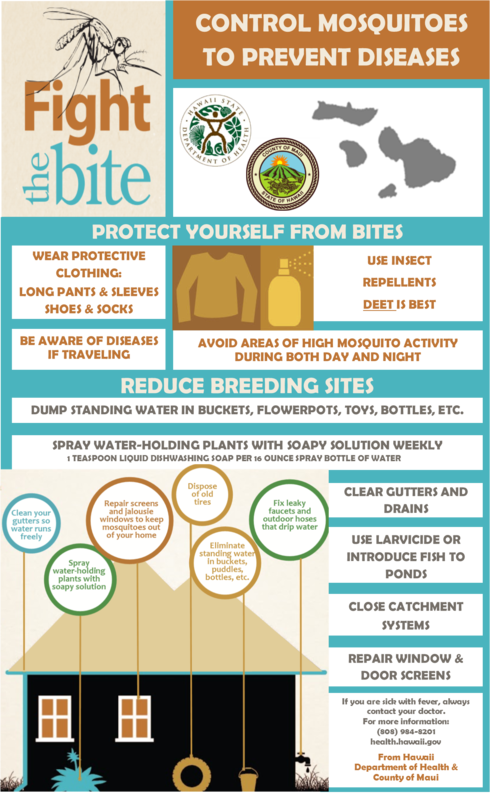 This is an important consideration because of the large population of poultry we have on Maui. Our aedes albopictus mosquito actually prefers animals to humans, so at times chicken can actually act as a sentinel and a decoy. Yes, all of these info graphics are in the Public Domain. Fantastic info graphics. Are they available for use on other sites? Flavivirus is a genus of viruses and includes the West Nile virus, dengue virus, tick-borne encephalitis virus, yellow fever virus, Zika virus and several other viruses which may cause encephalitis. Human infections with these viruses are typically incidental, as humans are usually unable to replicate the virus to high enough titers to reinfect the arthropods needed to continue the virus lifecycle – man is then a dead end host. The exceptions to this are yellow fever, dengue, and zika viruses, which still require mosquito vectors, but are somewhat adapted to humans as to not necessarily be dependent on secondary animal hosts. However, the secondary hosts are important transmission routes since they cannot protect themselves from the required repeat mosquito bites. 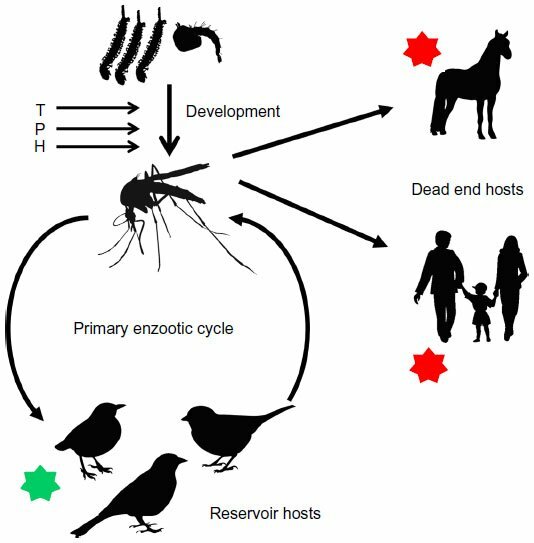 The life cycle of the virus is normally a bit more complex as it often involves secondary host such as bird flocks, that can amplify the concentration of the virus in their blood and create a virus reservoir that can easily infect thousands of mosquitos via repeated bites.